On Saturday, I ran the Coast Mountain Trail Series Survival of the Fittest 18k distance. First of all, it felt weird to race on a Saturday. I had a busy week leading up to the weekend and didn’t have that extra day to ready myself. When I got home from work on the Friday night I quickly layed out my clothes and filled up my hydration pack for the next morning. Then I went off to slopitch. I didn’t get home and in bed until 11pm and had to wake up at 5:30am to drive up to Squamish for the race. After a little confusion about what time we were leaving at, my friend picked me up and off we went. My running attire comprised of my BibRave tank (of course), Lululemon SeaWheeze shorts, my favourite Under Armour ankle socks [affiliate link], Nike sportsbra, my Salomon Sense Pro trail runners [affiliate link], and my Nathan VaporShape hydration pack. I wore my Nike “impossibly light” jacket for a little extra warmth before the race. We got up there early and hung around the start/finish line while people filtered in. It was sunny and warm (but not too warm!) and the mountains surrounding us looked spectacular! I picked up my race bib, hit the washrooms (the last ones I would see for 18k), and watched the kids race (so adorable!). The race director gave us the speech on what to do and what not to do while wearing a hilarious hat and then we were off! The 13k distance runners followed 15 minutes after us. 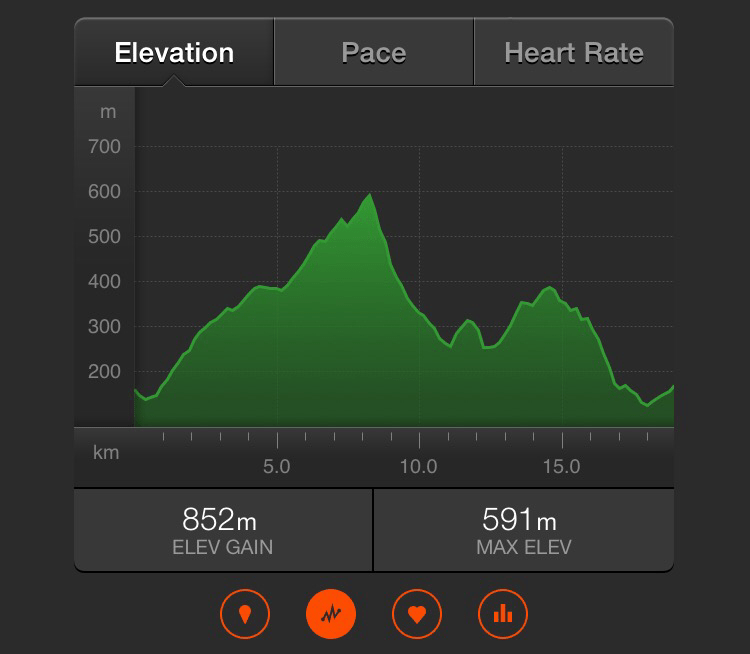 The course started with a short descent followed by 8k uphill then a steep 3k downhill section. The remaining 7k had a couple little climbs, and downhill stint, and then a last short gruelling climb up to the finish line. You know you have to run the last hill hard … because people are watching! I finished with a time of about 2:40. I didn’t really have a goal but I figured I’d be somewhere in the 2:30-3:00 range. It was my first trail run without photo breaks (well maybe just one really quick one), snack breaks, and “wait for people (me) to catch up” breaks. The route was beautiful. I’ve run portions of it before but it seemed even greener and more lush this time. However, I was zooming by (ha!) and didn’t get to fully appreciate the scenery. While the last runners were filtering in, the race gave away a table full of prizes in a hilarious and haphazard fashion. One contest required runners (all at once) to try to throw their shoes into a container … but in a surprise twist, the winner was the one who put both their shoes back on and made it to the prize table first! The things people do for free stuff! We left before the prizes were all gone. Unfortunately, we didn’t have time to stop for the usual post-run meal, a burger and beer, but we did hit up a local coffee joint on the way home. We used free tokens that we had received at a Squamish50 orientation run and I helped myself to a delicious, black coffee. Weekend Adventures: Bikers, and wasps, and bears! Oh my! I’ve never heard of an 18k race. Looks like a beautiful place to run congrats!